Training your cattle for winter grazing is quite easy if you follow the simple steps laid out in this article. Just because the snow begins to pile up in your pastures does not mean you need to end your pasture rotation and switch to cattle feeding. As long as your winter pasture quality is worth digging for, it is easy to train your cattle to dig though a blanket of snow to get at the buried grass below. Once they discover that the grass beneath the snow has not been crushed flat and is tasty and nutritious enough to meet their nutritional needs, they will quickly develop the habits to successfully continue to graze through deep snow. Doing your homework during the growing season to create high quality winter pastures specifically designed for grazing through snow. Monitoring pasture quality to ensure that the cattle will be rewarded with high quality pasture if they make the effort to dig under the snow for their dinner. Maintaining a grazing routine that forces the cattle to adopt grazing habits that allow them to graze though deep snow. And ensuring that your winter pastures are tall enough to poke through the surface of the snow. Tall grass will keep the snow loose and creates a trail of cookie crumbs for the cattle to follow to the buried grass below. and pasture quality that's worth digging for. Most conventional farmers automatically start feeding their cattle as soon as the snow flies. The cattle have come to expect it - the first dusting of snow usually turns peaceful grazing cows into a raucous and demanding rabble, bellowing at the gate for a feed wagon to arrive, regardless of how much grass is still left in the pastures. Considering that most conventional late-fall grazing pastures consist of short grass re-growth that's only a few inches tall, the cows are usually right to demand a feed wagon. The first heavy snowfall completely buries all the short, weak grass leaves and crushes the grass flat against the soil. Because the pastures were not prepared specifically for winter grazing, these farmers have no choice but to switch to cattle feeding. However, if you've done your homework during the summer to create tall high-quality winter pastures, then there's no reason to give in to the cattle's most insistent demands for a feed wagon just because there are a few flakes of snow on the ground. It's simply a matter of overcoming your cattle's expectations of seeing a feed wagon and teaching them the cattle grazing habits required to dig for pasture buried beneath the snow. Cattle are just as skilled at grazing through deep snow as bison, deer, and moose. Their ancestors, the wild auroch (the wild cattle of Europe), even manage to graze their way though several ice ages! 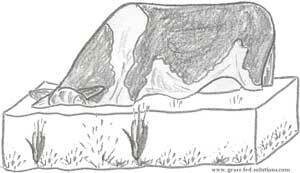 Cattle have the very same ability to shovel snow aside with their heads to uncover the grass buried. It's in their genes - they just may not know it yet. It's your job to encourage them to rediscover their snow-grazing skills. Cattle grazing through snow during a daily winter pasture rotation. High quality pasture doesn't suddenly become inedible just because of a bit of snow cover. Underneath the snow there is perfectly nutritious pasture. You don't need to guess if the pasture buried beneath the snow is worth digging for. Your livestock nutritionist will be able to tell from your forage analyses if the pasture buried under the snow contains sufficient protein and energy to justify your cattle's grazing efforts. In order to ensure that your cattle are receiving sufficient protein and energy from the winter pastures, you need to implement a monthly forage sampling program that analyzes the nutritional quality of your pastures. You need to know that the pasture beneath the snow is actually worth digging for. Your livestock nutritionist will use these forage analyses to calculate if your cattle are receiving sufficient calories from the pastures to stay warm and keep their body condition within safe limits. The nutritionist will also calculate a supplement mix to make up for minor protein shortfalls in the pasture quality. These protein and energy supplements can be added to the mineral mix in the mineral feeder, allowing you to continue grazing longer in the season even as the grass quality deteriorates. The salt content in the mineral mix keeps the cattle from gorging on the supplements. Your nutritionist will also be able to calculate when your pasture quality deteriorates too far to provide your cattle with sufficient calories to keep grazing without risk to their health. Working with a nutritionist takes the guess work out of your winter grazing program and gives you the confidence to resist the plaintive cries of cattle that are trying to train you to bring them a feed wagon. 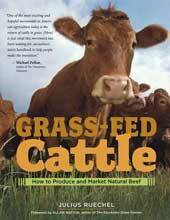 You can learn more about forage analyses and working with a livestock nutritionist in the "Planning for Winter Grazing" chapter of Grass-fed Cattle. Or, follow the link to read about some additional cattle nutrition tips for winter grazing that will reduce your cattle's energy and protein needs during the winter so you can graze longer and lower your production costs. Armed with the confidence that your winter pastures contain what the cattle need to meet their nutritional needs, you can set about overcoming their complaints and demands for a feed wagon. When the snow begins to fall, maintain a consistent daily grazing routine to teach your cattle that their dinner is still to be found in the pasture, just like during the rest of the year. By continuing your routine of providing fresh daily pasture slices even as snow begins to accumulate in your pastures, your cattle will soon get the message that they just have to dig a bit for dinner. As long as the pasture quality is high enough to provide the cattle with more calories than they expend digging for it, they'll keep on grazing once they accept the fact that the traditional feed wagon isn't coming. I cannot overemphasize how important it is to maintain a consistent routine of fresh daily pasture slices as you transition from fall into snow-covered winter grazing. A fresh new slice of pasture every single day is key. And pasture moves should be scheduled for the same time every day. Even an hour's difference in when you show up to open the gate to the fresh grazing slice can send your cattle into disarray if they are not yet accustomed to grazing through snow. However, once they get accustomed to the snow-grazing routine, they won't be so easily unsettled by any change in the routine. The key is to send the message that all is well, there is no need to panic because of a little snow, and that dinner is still to be found in the pasture and is worth digging through a bit of snow to reach. As long as the snow is the only change in their daily routine, the cattle will quickly adapt and overcome their expectations to be fed a cattle feed ration at the first sight of a snow flake. But if there are a wide range of other changes to their routine at the same time as the snow begins to pile up then your cattle will revert to old habits and line up at the gate. You only teach dogs one new trick at a time or they suddenly forget all their previous lessons. Even humans revert to deeply ingrained habits if change comes at them too quickly. But if change is gradual enough - one thing at a time - we can overcome our deeply ingrained expectations and habitual responses and replace them with new habits. New habits quickly become the norm once they are repeated often enough. Cattle are exactly the same, which is why training first-time winter grazing cattle to graze through snow is about keeping their routine as similar as possible while they are adapting to grazing through deep snow. If your cattle are not accustomed to winter grazing, save your highest quality winter pastures for when you need to train your cattle to graze through snow. You want to give the cattle the highest reward for their efforts so you can reinforce their new grazing habits of digging through snow. Children will move mountains to get at a hidden stash of candy, but won't move a finger if the reward is a stash of broccoli. Cattle are exactly the same - give them something worth digging for. The tastier the reward buried beneath the snow, the faster they will take to grazing through deep snow. Pastures that are susceptible to leaching during rain or wet weather (such as overly mature pastures) or pastures that are vulnerable to being covered over and crushed flat by the snow pack (such as short grass) should be used up before the snow begins to fall. Use these more vulnerable pastures in the fall or even at the tail end of the growing season, long before the winter sets in. Save your best pastures for winter grazing so that the quality of the grass under the snow is as high as possible and continues to reward the cattle for their efforts. Cattle grazing in snow will dig deeper if there is a trail of cookie crumbs to follow - tall grass that protrudes above the snow's surface provides that trail of cookie crumbs. Make sure that the grass you prepared for winter grazing is as tall as possible so it will protrude above the snow's surface. The exposed grass tips provide the cattle with a trail of 'cookie crumbs' to follow, encouraging them to dig deeper by following the exposed grass tips to the lush pasture buried beneath the snow. The tall grass also keeps the snow loose so the cattle can continue to graze easily. As long as some grass sticks above the snow's surface, it will wick solar energy into the snow around the exposed tips, re-crystallizing the snow into a granular, sugary texture that keeps the snow loose around the plant even as the rest of the snowpack becomes compacted and crusted over. You can learn more about 'solar wicking' and how to use it to overcome crusted snow surfaces during your winter pasture rotation in the "Planning for Winter Grazing" chapter of Grass-fed Cattle. As an example of how important these exposed grass tips are when training your cattle to graze through snow, I'll share an experience I had with a new cattle herd, straight out of the feed yard, which arrived on farm in mid winter, with 2 1/2 feet of thick snow in the pastures. After a couple of weeks of feeding hay from the emergency hay reserve to get them settled onto their new farm (and after I had trained them to respect electric fences using the electric fence training strategy described in Grass-fed Cattle), I took them out to a field I had specially set aside as my winter grazing training pasture. The grass in the pasture was particularly tall and lush going into the winter, so there was ample grass sticking through the surface of the thick snow to hold the cattle's interest and ample good quality pasture beneath the snow to reward the cattle for digging through the snow. Since these cattle were straight out of a cattle feeding program and unaccustomed to grazing in a daily pasture rotation, with or without snow, I continued to bring hay to their daily grazing slice every day to make the transition easier, but I made sure that I used the poorest quality hay in the shed so that the frozen grass was the tastiest treat on the menu. After two weeks the cattle were no longer bothering to finish most of the hay I was providing, preferring instead to return to grazing almost immediately after the excitement of a tractor with a hay bale had subsided. By this time their grazing skills had progressed so they were eagerly shoveling snow aside with their heads to uncover the grass buried below. Two weeks after starting their winter grazing program, I stopped feeding any hay. They had completely switched to winter grazing through the snow, all of their own choice. Not a single cow showed up at the gate to complain about the absence of a feed wagon. Each day's new snow-covered grazing slice was more thoroughly rooted through than the last. During the first few days of grazing through snow, almost half of the pasture remained untouched as the cattle primarily grazed the easy pickings, trampling much of what was underneath and not bothering to graze areas where the snow was thicker. But by the end of those 2 weeks the entire pasture was systematically rooted through and the cattle had switched to grazing as a group, working their way through the pasture and rooting through the snow instead of just racing as individuals from one exposed grass tussle to the next. Within a month they were even hollowing out heavily-crusted snow drifts to get at the lush frozen grass underneath. The cattle had access to an energy and protein supplement mix throughout their new winter grazing program, which was mixed into their mineral mix. Furthermore, within the first two weeks of grazing though the snow the cattle had also completely stopped using their frost-proof livestock waterer back at the corral, preferring to eat snow for drinking water. And neither tractor nor hay bale made another appearance for the rest of the winter. and design and implement a supplement program for each age group to address energy and protein shortfalls in your pasture quality. and have many years experience working with cattle so you can identify if your cattle are content or showing signs of stress. Your first experiences with grazing through snow should always begin by simply extending the fall grazing season into the winter, providing you and your cattle with a gradual transition to winter grazing by simply extending your normal daily grazing routine into the snow-covered months. and you make grazing the tastier, easier choice for your cattle. The cattle in this example were completely unaccustomed to any sort of daily pasture rotation and completely new to grazing through the snow. They were never forced to switch to grazing through the snow. They chose to switch of their own accord because I had carefully prepared a scenario that made it easy for them to adopt new grazing habits. Their taste buds led the way. Winter grazing skills improve with each successive cattle generation. Your cattle's winter grazing skills will also improve with each successive generation. 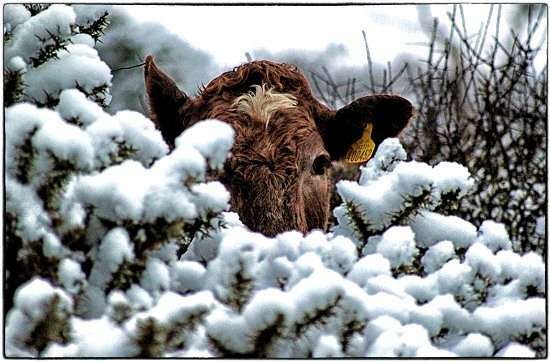 Cattle new to winter grazing usually like to keep their eyes and ears clear of the snow. But once they get accustomed to winter grazing, they will happily dig deeper. Second generation winter grazing cattle (cattle that grew up in a winter grazing program) will generally dig much deeper, eagerly submerging both eyes and ears beneath the snow to get at the grass buried underneath. And they will get progressively more skilled at using their heads as sweeps to brush away snow and break apart snow crusts. Horned cattle even learn to use their horns as sweeps or to break apart snow crusts. Training cattle to graze through snow is all about practice and perfecting your cattle's grazing habits through repeated use in a consistent daily grazing routine. The Seven Core Rules of Successful Grazing Management - a handy stripped-down reference list of the key grazing rules that every grass-fed beef producer needs to know.